Of the “big three” social media networks – Twitter, Facebook, and LinkedIn – each has its own challenges for nonprofits trying to spread their message, but to date LinkedIn has been arguably the least useful in this regard. LinkedIn is the social network with a business focus, the online equivalent of a semi-public rolodex and CV. One of the frustrations for organizations has been the complication of using the individual employee or volunteer’s LinkedIn profile to promote the nonprofit. To date, sharing has been pretty much limited to feeding your blog posts or Twitter stream to your profile page, and the ability to post (relevant) links in (some) Group discussions. That’s why we’ve tended to put LinkedIn at the bottom of the Big Three list, more useful for individual networking than as a social media outreach tool for organizations. Now, the times – they are a-changin’! Images and article excerpt: The chances of someone clicking through your shared article are greater when you’ve images and brief excerpts pulled from the news article or blog post. What you share looks great, and you can customize it completely. Easily re-share: Like what you’re reading and want to re-share it? That’s only a click away. And share it with your connections, your groups, or individuals – or all at the same time. Notice that the re-share has automatic attribution, too – that means when you re-share a link, it gives credit (“via so-and-so”) to the person who shared it with you. And vice versa, of course, giving credit to you when someone else shares your link. Attribution goes a long way to help people find and connect with like-minded others, so it’s more than a simple netiquette, it’s one of the main keys to effective social networking. A great step forward from LinkedIn here, I think, if long overdue... and maybe a hint that we might be wise to keep an eye on what else is new at LinkedIn! 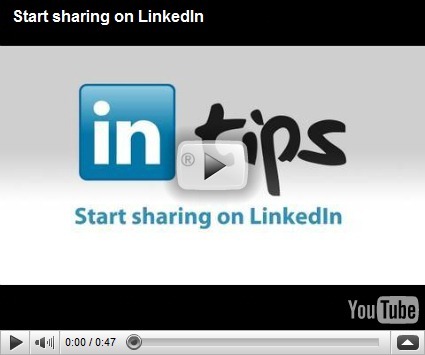 Are you using LinkedIn’s new sharing feature to help promote your nonprofit? it's about time LinkedIn jumped on board! I especially like the private sharing.